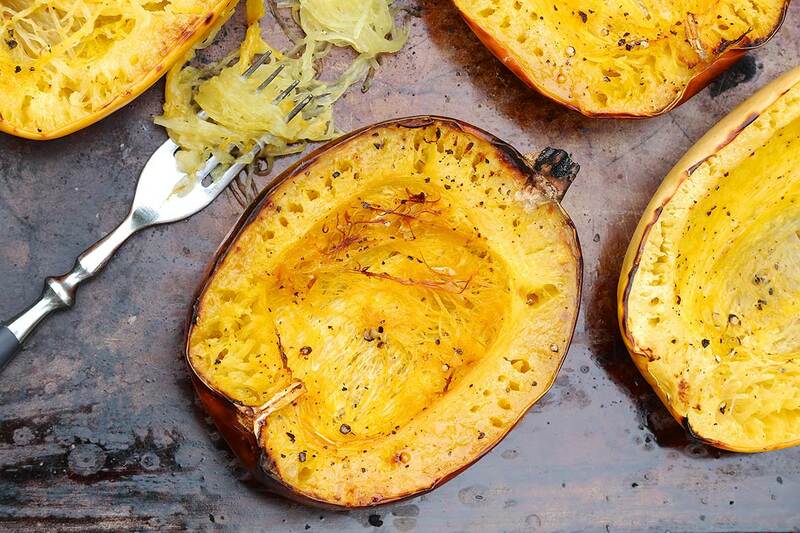 I’ve talked to many adults who never tried spaghetti squash but were eventually wooed by its low carb appeal. My unscientific research revealed that most were surprised by how much they enjoyed it, even though it’s not a carbon copy of traditional pasta. Cooked spaghetti squash is an excellent base for pasta sauces and a variety of proteins and delicious when simply tossed with a little butter or olive oil, sautéed garlic, salt and pepper. One of my favorite ways to enjoy it, however, is to use the shell as a serving bowl and combine the healthy “noodles” with familiar flavors to make a family-friendly meal. 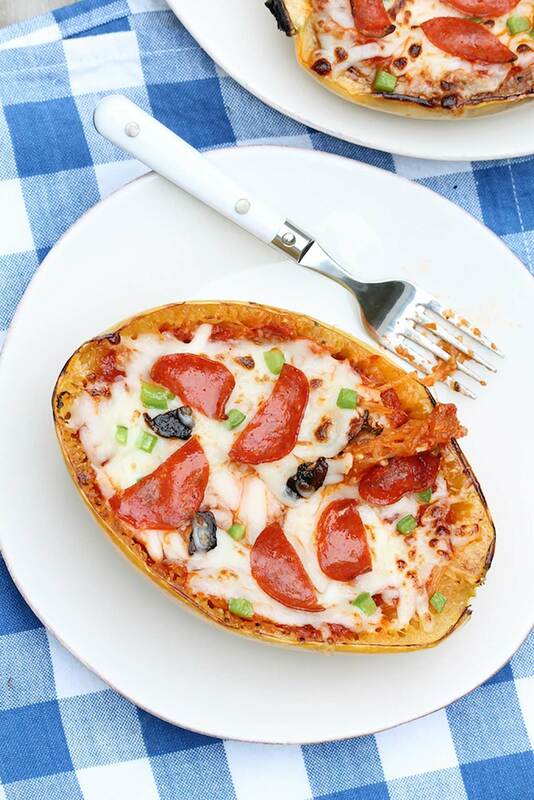 I’ve made these spaghetti squash pizza boats (pictured below recipe) for my family, young nieces, and a classroom full of middle schoolers to rave reviews. That alone is reason to try! My sister-in-law recently reported that this meal is now on the regular rotation and the girls like helping to make the pizza boats as much as they like eating them. I’ve also made a version of this leftover spaghetti pizza (directly below), with plain spaghetti squash noodles in place of the leftover sauced spaghetti. This variation would better compared to a frittata, but whatever you call it, it’s easy, delicious, and healthy. When considering other ways to enjoy, think to some of your other favorite meals and combine elements of them with the spaghetti squash. Beyond the pizza boat idea, for example, you can make enchilada, taco, or chicken alfredo boats, to name a few. These mashups lend good flavor and lots of kid (and adult!) appeal. The outer shells are hard and can be difficult to cut. 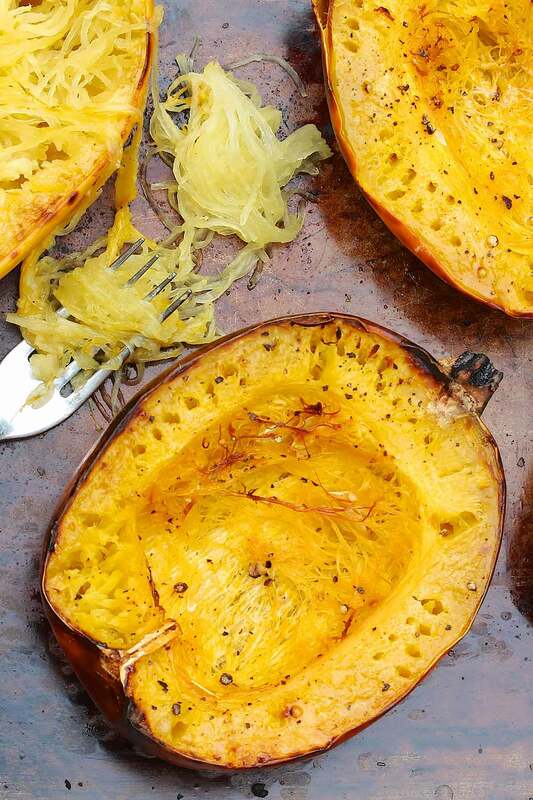 For less resistance, microwave the whole squash for about three minutes before cutting. Most recipe instructions for cooking spaghetti squash call for roasting with cut sides facing down. I have tried cooking with the cut sides facing up and there was no difference in taste or cook time. However, with this method the moisture that cooks out of the squash occasionally pools inside the squash. This is best poured off to prevent it from diluting any sauces that are added. Similarly, I prefer roasting to microwaving as roasting enhances the nutty flavor and cooks off more of the moisture. However, whole squash can be cooked completely in the microwave. Just be certain to pierce deep holes in the squash to prevent pent up steam from creating an unwanted squash explosion. Because squash size varies dramatically, cooking time is not precise. The squash is done when a fork can easily pierce through the skin and flesh, and the flesh can be scraped into spaghetti-like strands. When using the shell as a ready-made bowl, cut a thin slice from the bottom if needed to form a sturdier base. I have heard that large squash are naturally sweeter than smaller squash, although I frequently purchase the smaller squash and would be hard-pressed to tell the difference. Smaller shells do work better as bowls or “boats” for serving. While larger shells can serve as a serving dish, it’s often easier to transfer the ingredients to a casserole dish or several smaller bowls. Cutting the spaghetti squash in half width-wise (meaning the smaller of the equator options as opposed to the method pictured) will result in longer strands. This method of cutting doesn’t work as well if you wish to eat out of the shell but can be a fun experiment when cooking with kids. One cup of spaghetti squash has just 31 calories, 0.6 grams of fat, and 7 grams of carbs and is a good source of potassium, fiber, and Vitamins A, C and B6. Yield: This recipe will make four side portions or will generously serve two for a full meal. Optional toppings: pepperoni, black olives, ham, cooked sausage, peppers, sautéed mushrooms, crushed red pepper flakes, etc. Preheat the oven to 400 degrees F, and lightly grease a baking sheet or line it with foil for easy cleanup. Using a fork, shred the inside of the squash until the flesh is spaghetti-like, leaving about 1/4-inch of the squash in tact around the border so the shell doesn’t collapse. 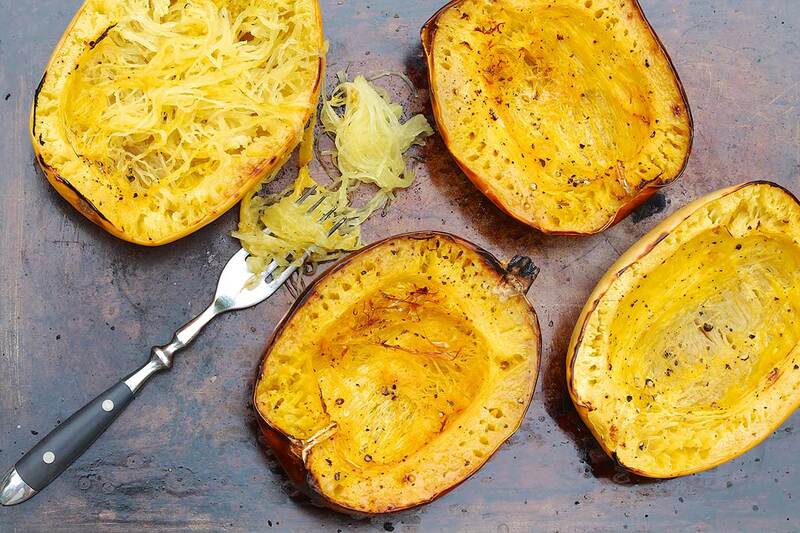 Prep-ahead tip: Spaghetti squash may be baked in advance. Either allow the cooked halves to sit on the counter for up to 2 hours or cool, cover, and refrigerate for a day or two. 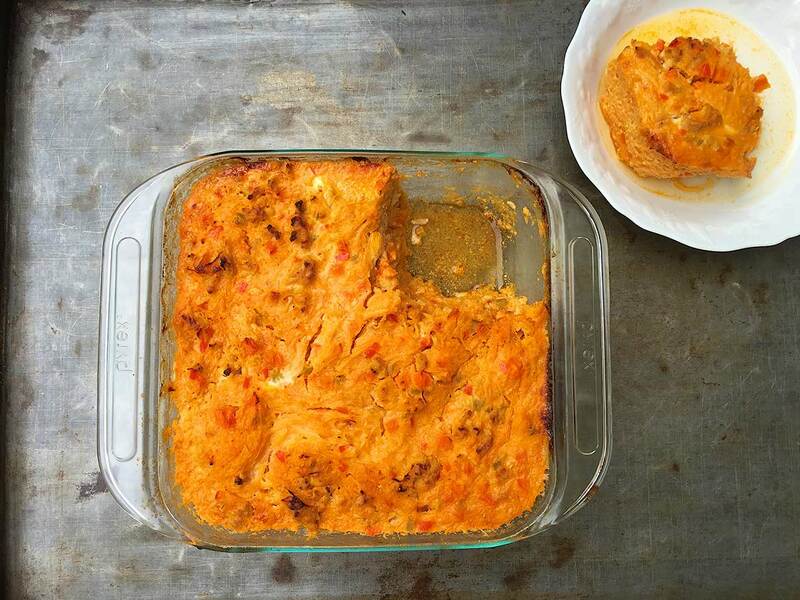 Buffalo Chicken Casserole from Juli Bauer’s Paleo Cookbook is a recipe I originally made for a friend who was struggling through Whole30. She went on to make this spaghetti squash-based dish several times a week throughout the program and says it’s still a favorite. I love it, too, but add blue cheese–which is delicious although not Whole30 approved! I’ve made Spaghetti Squash Pizza Boats for children, grandparents, and a classroom full of middle school students…and it’s always a surprise hit!